Embellished nail craze takes a major twist this Karwa Chauth. 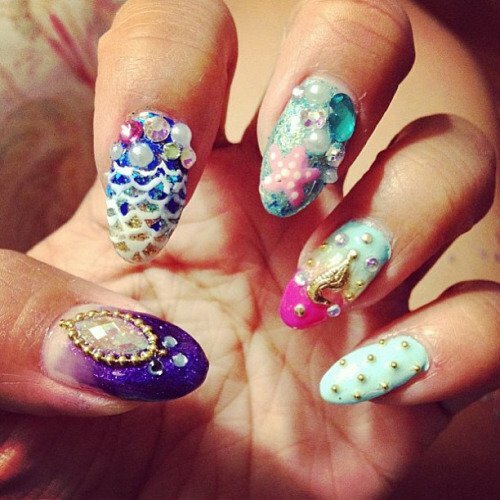 Check out best of the best nail art designs and spread festive bling! Ladies! Are we all set to glam up this Karwa Chauth? So, now that the outfit is ready, makeup ideas have been well thought-through, hairstyle has been decided as well, and hands are decorated with a beautiful mehendi design, you are all good to go! But, hang on! Don’t you forget to sport a stylish nail art design? If you are already done with the regular designs, then here are 18 stunning ideas for a heavy, embellished nail art look. Nail art is in trend these days, and if you are already bored of the typical nail art looks, then here are a few bling-y, elaborate and heavily embellished nail art designs for you to draw your inspiration from. This Karwa Chauth, for a bit too crazy styles, wear pearls, lace, rhinestones, glitter or Swarovski crystals. Use them for a gorgeous nail art design and a classier looking you. Here are some of the best nail art designs that are suited for the occasion of Karwa chauth, as well as Diwali. Whether you are planning to wear a simple traditional outfit, let’s say an elegant Pakistani salwar kameez in pink or a heavy red colored lehenga, these nail art designs can really enhance your overall look. For a plain outfit, the Swarovski crystals of the nail art design can add all the jazz to your Karwa Chauth look. If it’s a lehenga or a saree with heavy stone embroidery, then compliment the look with the nails having a similar style and color of stones. Our all time favorite is a red nail art. 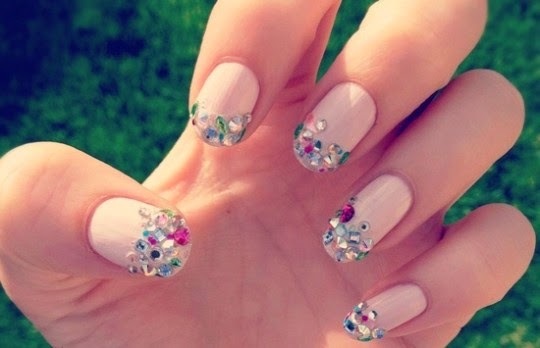 Throw in some glitter on the tips only if you aren’t in the mood for a lot of bling. Or else, style it with enchanting rhinestones. You can also give it a dramatic spin with the fab contrast designing. Flaunt it on a special day like Karwa Chauth or wear it on the wedding day. This bold nail art is mind-blowing! Yes, can look extremely graceful too if teamed up with a rather simple outfit. Another favorite is the striking, generous pink nail art which has been decorated with embellishments in different patterns. You can pretty much customize these designs to your own liking. Create your own fashion statement as per the mood and the occasion. You can also wear acrylic nails to show off a quirky side of your’s. Express yourself by adding studs and crystals, glowing glitter, floral accents, and tiny bows. The way to go about applying these accessories is by gently place them on top of the color and shade of your preference. For a mega embellished look, we recommend opting for Swarovski crystals, micro beads and tiny metal jewel hoops. Apply basecoat of your choice, and then immediately place a few hoops on your nail. Fill each nail with more basecoat, and put a crystal inside for an ultimate festive look. Have fun and decorate your nails with all the bling this Karwa Chauth!